This study deals with the problems involving translating Arabic cartoons into English and the strategies that can be adopted by a translator to make them more accessible and more target-audience friendly. It uses an approach based on Halliday's Systemic Functional Linguistics (SFL; Halliday 1985/1994; Halliday and Matthiessen 2004). The concept of equivalence is revisited within the framework of SFL to include register analysis and the three strands of meaning or metafunctions. 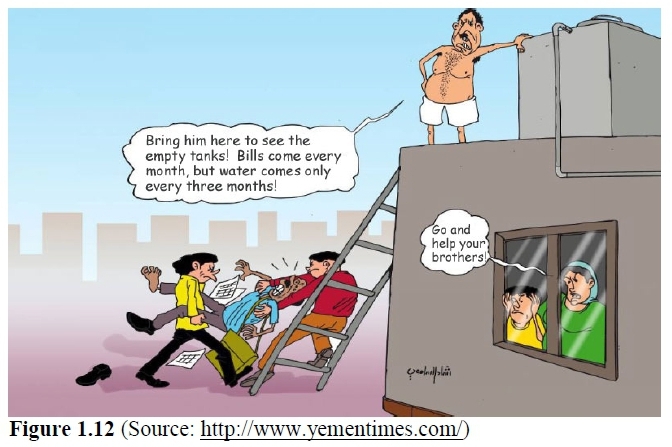 The study is based on a number of Yemeni cartoons that have been translated in the Yemen Times, a prominent English-language Yemeni newspaper. The study concludes that if a cartoon is to be translated in such a way that the target cartoon sounds as natural and entertaining to the target audience as the original, the translator should take into account the context of culture, the context of situation (i.e., register analysis) and the metafunction(s) involved in the source cartoon and tries to render them as far as possible in the target language. In addition, a cartoon is a multi-semiotic genre in which both text and image go hand in hand. The image-text semantic relation in this multi-model discourse can facilitate the comprehension of the context and the interpretation of the schemata of the cartoons more clearly. The translation of a cartoon cannot be achieved unless the two codes are considered. Cartoons have become an interesting way to tackle several issues of society, and they touch the hearts of millions of people across the globe. It is not surprising then that various media outlets have utilised the power of cartoons, and they devote special sections to them in their newspapers, magazines, tabloids, etc. Cartoons are not also the monopoly of formal media; they have also been introduced in the works of graffitists and the textbooks of pupils at schools. Cartoons can deal with different social, economic, religious and political topics in a very simple manner. They appeal to people of all ages and they capture the attention of all. However, it might be extremely difficult to understand the message of a particular cartoon. A mistaken notion about cartoons is that they are designed to be humorous but this is not always the case. In addition to their entertainment function, cartoons are likely to educate readers, inform them, arouse their feelings and instruct them to act positively. As Corstange (2007: 293) argues, "cartoons provide a venue for political speech, and, in the context of societies which suffer from shaky freedoms of expression, provide also a venue to express political dissent." The current study deals with the problems of translating Arabic cartoons into English, and the strategies that can be adopted by a translator to make the translation more accessible and communicative to the target audience. Cartoons are treated as a multimodal genre in which both visual and written modes need to be considered during the process of translation. We will therefore attempt a holistic approach to translating cartoons that takes into consideration the analysis of meaning potential across the visual and written modes. Although the study deals with Yemeni cartoons, the cartoons analysed in the study are used as microcosms of Arabic cartoons in general, because Arab cartoonists tackle more or less similar socio-cultural and political topics (Al-Labād and Ḥajāj 2005). Due to the novelty of this genre in Yemen and many other Arab countries, we first discuss its significance and present a brief history of its development in the Yemeni context. I am still continuing in the same path, exposing the truth and revealing the real image of the religious clerics and sheikhs in Yemen. The last threat I had was from the case of Sheikh Ali Al Awadhi and the murder of two youths (Khalid Al-Khatib and Hassan Aman), both in their twenties. I drew Al Awadhi and under his beard were the two young victims in hiding. The cartoon spread like a virus. It may be argued that caricature is an ancient art in Yemen and in Arabia. Drawings found on ancient discovered stones which date back more than three thousand years can be regarded as a precursor to cartoons. However, caricature in its present form is relatively new in Yemen as it dates back to the 1960s. The Yemeni revolutions in the north and the south of the country in 1962 and 1963 respectively, as well as the influence of the Egyptian press that played a vital role in shaping the political scenario in Yemen at the time, have given an impetus to the thriving of this art. One of the earlier Yemeni cartoonists is Abdul-Majeed ʿurāsī, who published his cartoons in the Aden-based Al-Ṣabāḥ and Funūn Al-Jazīra newspapers. In the 1970s and 1980s, a new generation of cartoonists appeared. To this generation belongs ʿAdnān Jumʿān, who disseminated his cartoons through The 14th October1 state-run newspapers, as well as the only Yemeni female cartoonist thus far namely, Jamīlah Al-ʿAzānī. The leading newspapers in the north of the country have also paid great attention to cartoons. Mufīd Al-Yūsifi, Abdul-Azīz Ibrahīm, ʿArif Al-Badawī, Rashād Al-Samiʿī, Al-Shaybānī and Kamāl Sharaf have demonstrated their talent through the Taiz-based Al-Jumhūriyah and the Sana'a-based Al-Thaurah newspapers (Al-Jumhūriyah 2008). However, cartoon art in Yemen reached its high point in November 1992 when a specialised caricature magazine was released by the late Iṣām Saʿīd Sālim, which continued to be issued until 2007 (Al-Hayjami 2014). This is the only specialised cartoon magazine in the history of Yemen. The country's move towards democracy after the reunification in 1990 encouraged cartoonists to freely tackle political, social and economic issues. With the advent of the Arab Spring, political cartoons have come to the forefront and dominated the scene in both electronic and print media of the Middle East. Some daily and weekly newspapers and magazines in Yemen allocate a page for cartoons. Others have a long supplement in which a recap of key events is presented. In addition, famous Arab TV channels such as Al-Jazeera and Al-Arabia have devoted part of their coverage to cartoons depicting current issues in the Arab world. Some English-language Yemeni newspapers (e.g. 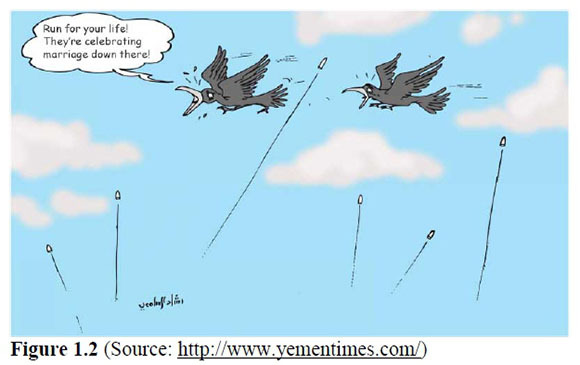 Yemen Times) used to collect some interesting cartoons from various sources and have them translated into English. The online availability of those newspapers has enabled them to reach a wider international audience which is interested in the Yemeni and Arab socio-political transformations. The topics of the cartoons range from local issues, such as the ousting of some Arab presidents, to regional, national and international issues. The cartoons analysed in this study all have something in common: all usually use captions or speech balloons, which facilitate the comprehension of the semantic content of the cartoon. However, the caption alone may not suffice to clarify the semantic content of a cartoon. A degree of background knowledge and familiarity with the context is required to get the message across. If that is the case with original cartoons, translating them will be even more challenging and may require some kind of intervention on the part of the translator. If translation is "meaningful records of communicative events" (Hatim 2001: 10), those records of events need to be made clear before translators embark on the translation of a cartoon. This will be difficult if a translator of a cartoon ignores the context of the cartoon under investigation. Studies on the translation of cartoons are relatively few if we compare them with studies that have been done in neighbouring fields, such as comics and jokes. A cartoon and a comic strip are two different yet related genres. While the former refers to a single panel image tackling a specific issue, the latter is a story which is narrated through a sequence of panel images. From a translational perspective, the translation of cartoons also involves problems that are frequently encountered while translating comics and humour in general. In the following subsection, we will briefly survey some of the studies that involved the translation of comics. Studies on cartoons will be discussed in 3.2. Many studies have been conducted on the translation of comics. Hellgren (2007) analysed how translator Sari Luhtanen rendered as subtitles the allusions found in the television show, The Simpsons, from English into Finnish, and to what degree she chose to omit the allusions from the subtitles. Hellgren (2007) used Leppihalme's (1997) classification of translation strategies with a view to finding out how a translator can successfully translate such allusively dense audiovisual material. Macková (2012) investigated the specifics of comics translation. The study concluded that matters of format, the type of binding, the size of speech balloons, the preference of colour and the graphic techniques are key elements in the translation of comics. Macková (2012) also pointed out that both pictorial and written parts of comics are often so intertwined that the translator needs to consider them both in order to fully grasp and render all the meanings they present. Koponen (2004) discussed wordplay in Donald Duck comics and their Finnish translations, especially the kind of wordplay that arises from the interaction of the words and images. Koponen argued that the translator should consider the image when translating the text. The study recommended that translators should attempt an analytical examination of what creates the humorous effect. This analysis helps the translator to determine the meanings in the source text, and to evaluate the reproduced effects in the target text. The study claimed that the translator will very rarely, if ever, be able to produce a close translation of the wordplay because wordplay and humour are very closely connected to the source language and source culture. Finally, "TranscUlturAl: A Journal of Translation and Cultural Studies" devoted a special issue to the translation of comics. The studies included in the issue focus on some theoretical aspects of translation such as the concept of 'faithfulness' or 'fidelity' in translated comics (Abril 2016; Assis 2016). Other studies tackled some technical aspects of translating comics such as the link between comics translating and subtitling (Borodo 2016), and the use of translation annotations to investigate the practice of scanlation (i.e., scanning, translating, and editing comics from one language into another) and its specificities (Fabbretti 2016). One article expands on the pedagogical value of the translation of comics in teaching economic and financial texts (Falco 2016). The remaining articles concentrate on some cultural aspects of comics translation. Aragao (2016) investigates the translation of cultural items and how those can reveal identities and values. Finally, Kenevisi and Sanatifar (2016) have shown the types of difficulties in translating Hergé's Tintin comic in Iran. The study highlights the impact of the Islamic revolution on the cultural activity of comics translation in the country. It analyses three translations of the work with a view to demonstrating how comics translation has been moving from a central position to a more peripheral one in the Iranian cultural polysystem. Compared to comics, there appears to be a dearth of studies on the translation of cartoons. Yakin (1999) discussed the translation of humour with reference to the cartoons in Laman and other popular weekly Turkish magazines. Yakin (1999) argued that the cartoons, which are not strictly political nor crammed with regional issues and accents, are translatable. They could be understood by an outsider with the help of an adequate amount of contextual and cultural background information. Yakin (1999) adds that the amount of contextual information should be carefully decided to meet the needs of the target readership. A translator should not give unnecessary, redundant information because this may corrupt the meaning of the cartoon. El-Arousy (2007) investigated the problems of translating Egyptian cartoons into English. The study concluded that a translator of cartoons is required to render the cultural distinctiveness of the cartoons, the scripts2 expressed in the linguistic component as well as the nonwritten and/or semiotic cues of the drawings, and relate them to the incongruity expressed in the two scripts. Zanettin (2010) differentiated between the translation of humour in cartoons and the translation of humour in comic strips and comic books, highlighting differences and similarities. Zanettin (2010: 48) argued that humour in cartoons stems from some kind of incongruity within the drawing itself or between visual and written signs, which readers expect. In the case of most comic strips, however, humour is the product of the simultaneous comprehension of the image and the words within the image. Zanettin (2010) argued that humour is never just in the words, as we might see in a cartoon - it is in who says them. Cui (2012) examined creativity in translating cartoons from English into Mandarin Chinese. The study argued that the translator should try his/her best to provide a creative translation in the target language. In other words, the language of the target cartoon can undergo a certain degree of rewriting so that the translated text sounds natural, educational and entertaining to the target language audience. The study concluded that domestication and cultural adaptation are common strategies adopted by translators in the process of rendering a translated cartoon. Judickaitė-Pašvenskienė (2014) studied the translation of English idioms in the Lithuanian subtitles of children's cartoons with a view to finding out whether meaning alone or meaning and form takes preference in the Lithuanian translation. The study particularly focused on the processes which take place during the translation of English idioms containing proper nouns. The study concluded that the element of meaning, rather than the composition of meaning and form, takes preference in the Lithuanian translation. Guyer (2016) discussed some problems regarding the translation of Egyptian political cartoons. The study focused on the rendition of humour and satire in Egyptian cartoons. It also considered the rendition of symbols rooted in local contexts but which were likely to be illegible to target audience. Issues related to puns and tropes were also discussed. Admitting the difficulty of translating cartoons, Guyer (2016: 213) observes that "[t]here is no such thing as a correct or perfect translation. The translator of cartoons is an artist, requiring a diverse toolkit and a clever wit". Taran (2014) discussed some cultural, technical and linguistic difficulties of comics and cartoons that the translator encounters. The study focused on the translation of onomatopoeic words and puns. The study also dealt with some technical problems in the translation of comics and cartoons such as limited space, special language, and the interference of publishing houses, that are likely to force a translation either to suit a particular ideology or to boost sales. Whereas the immense practical act of translation itself is […] increasingly being theorized in what has come to be known as translation studies […] the combined object of humour translation must have seemed until now so vast, disorientating and dangerous an ocean that few academic efforts were made to theorise the processes, agents, contexts and products involved. In this study, we are looking for a holistic approach to the translation of cartoons that takes into account the multimodal/multi-semiotic specifics of cartoons and the linguistic features they share with other genres. Our approach is presented in the subsections to follow and it is based on a solid theoretical framework that pays equal attention to the visual and textual dimensions of a cartoon. In fact, a multimodal translation of a cartoon that preserves the image and characters of the original may look foreignised to the target reader. Cartoons deal with diverse topics and they sometimes tackle issues that may not be understood outside a local community. A translation should enable the target reader to understand the other. The written message, if any, should be domesticated and made clearer to some extent in order to facilitate the comprehension of the meanings inherent in the image that may look a little foreignised. In short, a good translation of a cartoon should not aim for either domestication or foreignisation. As Sun (2011: 163) points out: "[f]oreignization and domestication are indispensable and supplementary to each other and the idea that truly successful translation will depend on the unity of the two methods should be kept as a golden mean in every translator's mind." We use an approach based on Halliday's Systemic Functional Linguistics (SFL; Halliday 1994; Halliday and Matthiessen 2004) as a framework for the current study. As Halliday notes, SFL is functional because "it is designed to account for how the language is used. Every text [...] unfolds in some context of use" (Halliday 1994: xiii). A translator should not underestimate the significance of the context while translating this genre in which both visual images and texts, which are deeply rooted in a particular culture, are combined. In other words, a translator is not only required to transfer meanings into a target language alone but into a target culture that is likely to be remote from the source culture. He/she is therefore required to understand the social and cultural contexts of the source text/cartoon. Following Malinowski (1923), Halliday emphasises that a text takes place in two contexts: the "context of situation" and "context of culture". While the former refers to the immediate context surrounding a text, the latter refers to the wider context of culture. A context of situation is characterised by a particular register of language (Eggins 2004). "Register", here, refers to a configuration of meanings that are typically associated with a particular situational configuration of Field, Mode and Tenor. Halliday adds that register is a configuration of meanings and thus it should "include the expressions, the lexicogrammatical and phonological features, that typically accompany or release meanings" (Halliday and Hasan 1985: 38-39). A thorough and correct understanding of these three variables is fundamental, we believe, for the translator. A translator who is capable of identifying these different dimensions [Field, Tenor and Mode] and is able to reproduce them in a different language, the [Target Language], is better able to offer a text which is 'functionally equivalent' to the source one, even though the structures be different - because languages are different. Interpersonal meaning is related to the enactment of social relations (social reality), or tenor; ideational meaning is related to the construction of institutional activity ('naturalized reality'), or field; and textual meaning is related to information flow across media (semiotic reality), or mode. [when considering] the importance of semantic content in what people find funny, it is clear that the ideational metafunction is central to humor. In cartoons where text and image interact, the textual metafunction plays a role […] While the prime source of humor in the cartoon is ideational, the interpersonal metafunction can influence the perceived funniness of this humor. In the words of the old adage: It is not (only) what you say, but how you say it. It can be argued that if a cartoon is to be translated in such a way that the target cartoon sounds natural and entertaining to the target audience, the translator should take into account the context, the register variables and the metafunction(s) involved in the source cartoon, and try to render them as far as possible in the target language. The use of SFL in the translation of cartoons can, therefore, facilitate a translation that meets both the requirements of creativity and translation adequacy. In addition, a cartoon is a multi-semiotic genre in which written texts and images go hand in hand. Therefore, a translator needs to account for the multimodal (Kress and Van Leeuwen 2006; Kress 2010) material used in a cartoon to show how the different modes - written texts and images, different font types and font sizes, scripts (Roman and Arabic), colour, etc. - are deployed for meaning making. Multimodal discourse analysis is an offshoot of Hallidayan SFL and social semiotics (Kress and Van Leeuwen 2006; Kress 2010). The image-text relation in this multimodal genre analysis can facilitate a clearer comprehension of the context and the interpretation of the cartoons. This adds an impetus to the use of SFL and multimodality in translating cartoons. Multimodality is based on the assumption that meaning is not only associated with the linguistic mode; rather, it "resides so strongly and pervasively in other systems of meaning, in a multiplicity of visual, aural, behavioural and other codes, that a concentration on words alone is not enough" (Hodge and Kress 1988: vii). The translation of a cartoon cannot be achieved unless the modes used for meaning making are explicated (Kress and Van Leeuwen 2006; Kress 2010). This involves describing how written texts and images complement each other across the expression plane, the content plane (i.e., grammar and discourse strata) and the context plane (i.e., register and genre; see O'Halloran (2005) and (2007)). This also entails accounting for visual-written coherence and intersemiotic cohesive devices such as intersemiotic parallelism (i.e., language and image share a similar form), intersemiotic polysemy (i.e., written and visual components share multiple, related meanings), logical relations between language and images (e.g. intersemiotic comparative relations, additive, consequential and temporal relations; see (Liu and O'Halloran (2009)) that play a role in the comprehension of the topoi of a cartoon and hence its translation (for more details about the above concepts, see (Kress 2010; Kress and Van Leeuwen 2006; Liu and O'Halloran 2009)). It would be useful to approach the concept of 'translation equivalence' from an SFL perspective with special reference to cartoons. Equivalence is a key concept in translation studies, and has been a matter of heated debate and discussion among philosophers, linguists, and translation theorists. Their debate has produced a number of dichotomies such as Nida's (1964) "formal vs. dynamic equivalence", Catford's (1965) "textual equivalence vs. formal correspondence", and Newmark's (1977) "semantic vs. communicative equivalence". Other classifications of translation equivalence have been attempted by several scholars. Hatim (2001), for instance, argues that equivalence can be formal, denotative, connotative, text-normative, and pragmatic or dynamic. Baker (1992) suggests a more detailed distinction of the concept of 'equivalence' at the lexical, grammatical, textual and pragmatic levels. Equivalence at different strata carries differential values; […] in most cases the value that is placed on it goes up the higher the stratum-semantic equivalence is valued more highly than lexicogrammatical, and contextual equivalence perhaps most highly of all. Equivalence, therefore, for Halliday, is functional and takes into consideration the linguistic and extralinguistic levels as well as the language metafunctions (i.e. ideational, interpersonal and textual). Each of these levels and metafunctions has a value on his scale. In this sense, the concept of 'equivalence' should be revisited to meet the generic conventions of multimodality (Kress 2010; Kress and Van Leeuwen 2006; Liu and O'Halloran 2009; O'Halloran 2007). Equivalence at the level of register should take into account the mismatches between the Field, Tenor and Mode of the original cartoon and its translation. Equivalence at the ideational metafunction should take into consideration the lexicogrammatical aspects of transitivity (e.g. the processes involved), tense, voice, lexical items, and the like. At the interpersonal level, aspects such as mood, modality, language varieties, style, and evaluative language should be investigated. At the textual level, aspects such as caption brevity, caption authenticity, intersemiotic texture (i.e., cohesive devices between text and image) should be considered. It is worthwhile to mention that even though we are adopting a multimodal approach to the translation of cartoons, we have found it necessary to integrate it with some translation studies models. House's (1977/1997) model of translation quality assessment, which is based on Halliday's SFL and so is compatible with it, will be used in our register analysis of the cartoons under investigation. House (1997) has identified a number of situational dimensions that can help with a register analysis of any genre. Some of these elements are additional to those expressly stated by Halliday (Munday 2001: 93). For the analysis of Field, a translator should find out the matches or mismatches related to subject matter and social action. As part of her analysis of Field, House (1997: 107) distinguishes between degrees of "granularity" in lexical items according to rubrics of specialised, general, and popular. In the analysis of Tenor, a translator should consider factors such as the social role relationship or the degree of "emotional charge" between the addressor(s) and the addressee(s) in terms of social power and social distance (House 1997: 108). Another element to be considered in the analysis of Tenor is social attitude. In this regard, House collapses the five styles that she used in her original model (House 1977) - frozen, formal, consultative, casual, intimate - into three: formal-consultative-informal. A third subdivision of Tenor is the writer's or translator's provenance and stance. The analysis of Mode includes two dimensions, namely medium and participation. Medium can be simple if it is written to be read, and complex if it is written to be heard. Likewise, the participation can either be simple (e.g. a monologue) or complex, such as a dialogue. The data used in this study includes the English translations of six cartoons that were published by a widely-circulated Yemeni newspaper, namely Yemen Times. This newspaper is published in English and it targets international English readers. The original cartoons are in Arabic and they were sketched by two well-known cartoonists, namely Rashād Al-Samiʿī and Kamāl Sharaf. The source cartoons cover different political, social and religious issues. They do not only appear in famous state-owned and private newspapers and websites but they also went viral on social media such as Facebook and Twitter. The six translated cartoons were published between June 2012 and May 2015 in the cartoons section of the newspaper. In fact, the tragic ongoing war in Yemen has greatly influenced the dissemination of the Yemeni newspapers and thereby the spread of translated cartoons. Yemen Times, the leading Yemeni newspaper in English, stopped its printed version and it switched to online-only edition. No translated cartoons have appeared on its website since May 2015. Hence, the study uses all the cartoons that were published by the newspaper during the above period (i.e., June 2012 till May 2015). Two of the six cartoons tackle the socio-cultural issues of marriage and the marital relationship, two are political in that they deal with Al-Qaeda and pilgrim trafficking, and the last two cartoons are socio-economical as they tackle water and electricity crises. vi. Finally, a description of problems at the genre level, if any, will be given. In the following subsection, we present an analysis of the six cartoons and their translations into English with a view to evaluating the kinds of multimodal/-semiotic problems encountered during the translation process. Consider the differing information value given in the cartoon in Figure 1.1, with that in Figure 1.2 below. 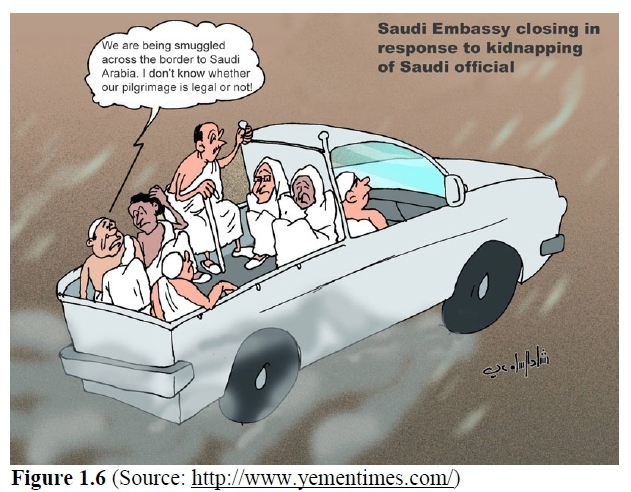 The above cartoon was translated by the Yemen Times as in Figure 1.2. The TC shows a kind of loss at the ideational, interpersonal and textual metafunctions. Since the target reader may not share the same schematic structures or "script" of marriage as Yemeni society, he/she could find it extremely difficult to comprehend what is meant in the SC. The incongruity of the cartoon and its source of humour can be reflected by considering the three metafunctions as depicted by both the written text and the image. At the ideational level, the interplay between the image and written text shows that there is an existential process that can be interpreted as "On the ground, there is a wedding", and two material processes that can be interpreted as "people are firing guns in the air while celebrating" and "shake/lighten your leg". At the interpersonal level, the bird in the lead is the addressor, and it seems that it is of a higher authority and is more familiar with the situation. This is reflected by the use of the imperative mood khif arjulak ('lighten your legs'). In addition, the visual and linguistic features are interrelated in this multi-semiotic cartoon, and constitute a certain type of intersemiotic consequential relation (Liu and O'Halloran 2009; Martin 1992). It would be more apt to render the cartoon as "Lighten your legs, dude. People are celebrating marriage below and they may shoot you dead". Even though "they may shoot you dead" seems self-evident from the visual mode, for those who are unfamiliar with Yemeni customs, we should not expect the common English-speaking reader to be familiar with this schematic pattern of a Yemeni wedding. If it remains unexplained, a culture-specific term (let alone a schematic pattern) may nullify the humour of the cartoon. Hence, the suggested translation preserves the ideational meaning of the original, the interpersonal meanings between the participants, as well as explicating the multi-semiotic relation between the textual mode of the cartoon and its visual mode. In a similar vein, equivalence at the metafunctional levels is not achieved in Figure 1.4. The source of humour in the SC lies in the incongruous situation between the man who walks in front of his wife, hoping to God that nobody should see him in the company of his spouse and the mouse which does not hesitate to express his love to his partner. The cartoon highlights one aspect of the oppression of women in some parts of Yemen, where women rarely step out of their houses without a male companion. The caption at the top right corner of the SC reads yaum al-kharjah al-sanwī, and has been rendered as "Annual picnic" in the TC. The translation has sacrificed the ideational meaning in the sense that having an annual picnic is very common throughout the world. However, what the cartoonist intends to say can be interpreted as an existential process, namely "There is only one annual outing for Yemeni women". As for the man's caption, it has been translated as "I hope none of my friends see us!" but that may not be understood by a reader who is unfamiliar with the Yemeni culture. It can be transcoded as "It would be a shame if someone sees me with my wife. Let's hurry. I pray to you, my Lord, that nobody will see us together". The articulation of relational and mental processes in the first sentence, the material process in the second sentence, and the verbal and mental processes in the third sentence, has made this aspect of the oppression of women clear to an uninitiated reader. At the interpersonal level, the phrase Allah yastir has been translated as "I hope". In fact, the phrase can evoke different interpretations, and it can be translated as "Heaven help! ", "God forbids", and "May God save or protect us". However, the use of the phrase in Yemeni Arabic can be different. This term can be used to pray to God to conceal a shameful or wrong act from public eyes. So, it would be rendered more aptly as "I pray to you, my Lord". As for the textual meaning, the translation of the cartoon in Figure 1.4 does not reflect the intersemiotic comparative relation that exists between the text and image. The caption and the image share similar experiential meanings. The image shows the man in his traditional Yemeni attire, turban and jumbia3 walking hurriedly for fear that others might see him walking with his wife in the street. The caption of the original cartoon is a different semiotic reformulation of the image (Kress 2010; Martin 1992). Similarly, the image of the mice and the caption reformulate the same logical relation. The male mouse is very happy as depicted by its broad smile, and it walks slowly with the female mouse, telling her "I love you as much as this big street". Although the translation in Figure 1.4 preserves the comparative intersemiotic relation between the visual image and the text, the target reader may find it difficult to understand the intention of the cartoonist. This can be made clear if the contrast relation that exists between the image and the text of both the man and the mouse is clarified. The man is reluctant to walk freely with his wife, even occasionally. He is leaving his wife behind in his hurry to remove himself from the public eye, and feels ashamed because he is walking with her; fear is very explicit in his demeanor. The mouse, however, seems happy, enjoying its daily walk in a leisurely fashion with its partner. "Let's go for our daily walk. I love you as much as this road, sweetie" could be a better translation than the translation in Figure 1.4. It may be argued that a target reader in English would possess the visual literacy to understand the cartoonist's intention as the contrast between the humans and mice is clear from the visual content of the cartoon. A reader may understand the cartoon as a critique of the conduct of an individual man behaving in a sexist way, rather than a critique of social practices in Yemeni society in general. Another instance in which the three strands of meanings have been lost in the translation is given below. During the annual Muslim pilgrimage, commonly known as haj, human smuggling becomes a thriving enterprise around the holy city of Mecca. The context of culture needs to be made clear from the beginning with a view to familiarising the target reader with the situational background of the cartoon. Although the TC shows some background information by using the material process "Saudi Embassy closing in response to kidnapping of a Saudi official", this does not reflect the most relevant aspect of the context of culture. In fact, pilgrim trafficking across the Yemeni-Saudi borders is a flourishing business due to the fact that Saudi Arabia identifies a strict quota of pilgrims for each country, thus a lot of people who do not get the chance to go on pilgrimage become prey for human traffickers. With this in mind, the cartoon would be more communicative if this background information was made clear either through the use of some material processes, such as "Only few pilgrims are officially allowed to go on haj this year", or through the use of a verbal process, such as "Saudi authorities said a strict quota of pilgrims will be given the chance to go on haj". This background knowledge can clarify the mental process of one of the smuggled people who appears in the image asking a youngster, perhaps his son, "Do you think our Haj will be accepted if we are smuggled?". This seems more apt than the translation given in the TC, where a relational process is used in a projected clause "I do not know whether our pilgrimage is legal or not!" In fact, haj cannot be legal or illegal. It can, however, be accepted or rejected. A grammatical resource realising interpersonal meanings in the SC is the use of the interrogative mood, which obviously functions as "demand for information". The translation has retained this function through the use of a declarative mood, but the interpersonal relationship between the addresser (i.e., the old man) in the image, and the addressee (i.e., the youngster) is not retained in the translation. 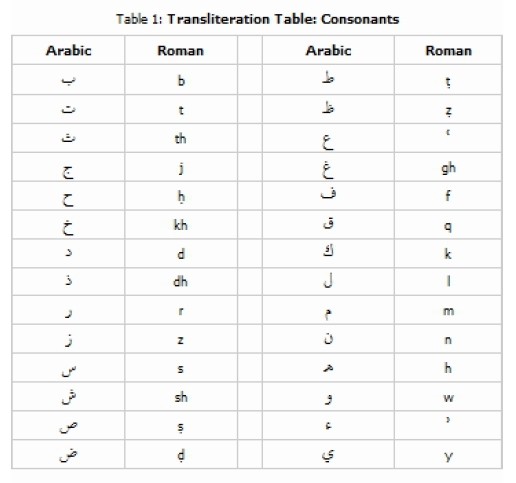 The informality of the SC represented by the vocative midrī yabnī could have been better preserved in the TC had the translator used the word "lad", which may be interpreted as a term of endearment. As far as the textual metafunction is concerned, the linguistic message clearly reformulates the corresponding image. The visual part of the cartoon shows a car with no license plate, which implies that the car is used in smuggling and human trafficking. The non-paved road adds another piece of evidence that it is an unusual route that smugglers use to evade border guards. The people in the back of the car are dressed in white, the dress of all pilgrims, and one of them clearly asks a person close by something. The question is linguistically articulated as midrī yabnī ('Do you think […] lad?'). Thus, an intersemiotic comparative relation is in play in this cartoon (Liu and O'Halloran 2009). This aspect of intersemiotic texture needs to be considered in the translation of the cartoon. Thus, "My lad! Do you think that our haj will be accepted if we are smuggled?" not only maintains the ideational and interpersonal meanings of the cartoon but also preserves its intersemiotic texture more accurately than the translation given in the TC. A fourth example of the problematisation of translation equivalence while translating cartoons is given below. The SC given above revolves around Anṣār Al-Sharīʿah. This is a sub-group of Al-Qaeda known by the mass media as "Al-Qaeda in the Arabian Peninsula" (AQAP). This SC tackles one of the suicide operations by Al-Qaeda affiliates that horrified the Yemeni nation. The translation of the cartoon undergoes a loss at the three metafunctions. The original cartoon depicts one of the members of Al-Qaeda as a butcher who is working in a shop branded as anṣār Mutiʿah shop ('the brainwashed supporters' shop') to emphasise the fact that Al-Qaeda affiliates follow their leaders blindly. However, the translator has inappropriately used the substitution strategy and translated the brand name as "Anṣār Al-Sharīʿah Shop". The addition of a note such as "on the last destructive suicide operation of Al-Qaeda" will enable the reader to understand that the allusive expression Anṣār Muṭīʿah is used to refer to Al-Qaeda. As is clear from the gloss, the original cartoon includes a wide use of nominalisation - a typical resource for grammatical metaphor (Halliday 1994) - but the translator has opted to use the reduction strategy, and has deleted the whole nominalised package in the translated cartoon. Here, grammatical demetaphorisation can be very significant in the process of comprehending the message. In other words, the translation will be more apt if we demetaphorise the heavy packaging of the clause as "The Brainwashed Youth Butchery and Restaurant serve different kinds of Halal meals. We offer (human) head platters and gunpowder platters. We supply all types of ambushes and dynamite baits". The sequence of clauses makes the comprehension of the message much easier. As far as the interpersonal metafunction is concerned, the appraisal system of the SC is not retained in the translation. The appraisal system of Attitude, represented by the judgmental expression maḥal Anṣār muṭiʿah, is translated as "Ansar Al-Sharī'ah shop". Anṣār Al-Sharīʿah ('Partisans of Islamic Law') is an ideological title widely circulated by the mass media. However, in interpersonal terms, it seems that the negative judgement conveyed by Anṣār muṭiʿah ('the brainwashed youth/supporters') is lost in the translation. Similarly, ḥūr al-jinān ('beautiful women of Paradise') is reduced in the translation, and thus the appreciation and ironic use of the term is substituted by a more generic term, i.e., "paradise". Ḥūr al-jinān refers to the extremely beautiful women of paradise. The cartoonist ironically refers to the promise given by Al-Qaeda to the suicide bombers that they will be martyrs and will get married to fair and chaste women in the paradise, and thus they should not feel sad if they do not win a fair lady in this life. Therefore, it is not only the Attitude appraisal system that is lost in the translation but also the ideational meaning. At the textual level, the analysis of logical cohesion across written and visual components helps the translator to produce a better translation of the cartoon. The multimodality of this cartoon shows that the image adds new information to the text. That is to say, there is a man who chops what appears to be a human foot using a blood-stained knife. In the shop, a head, a hand, and a bomb belt are hanging from meat hooks. Outside the shop, there is a devastating explosion as depicted by the flames of fire and the blood flowing on the floor. Thus, an intersemiotic additive relation (Liu and O'Halloran 2009) exists between the two modes. We should not, therefore, expect the target reader to be familiar with this coherence relation, meaning that basic details need to be made clear and supplemented by textual data such as "On the last destructive suicide operations of Al-Qaeda". This will be sufficient to provide the target reader with the schema of this image, and the context of culture. Another example of the problems involving the translation of cartoons is given in Figures 1.9 and 1.10. It seems that the translator has translated the first part of the written component literally, and he/she added some information that can be retrieved from the visual component as well as the background information provided by the cartoonist in the SC. Hence, the translator has, to a great extent, rendered the ideational meaning satisfactorily. There is, however, some gain in translation when it comes to interpersonal metafunction, as we will see below. The incongruity of the SC lies in the fact that the security officer is overlooking the weapons the tribesman is carrying, and is instead searching for iron chains. The target reader should know what kind of vandalism the cartoonist is talking about, i.e., the frequent attacks on electricity towers. In June 2012, saboteurs repeatedly threw iron chains onto the unattended electricity lines that link Marib Power Station with almost all Yemeni provinces. In doing so, they vandalised these power lines so that they no longer transmitted electricity. The attacks on power lines took place repeatedly in the region of Al-Gadʿan, between Marib and the capital Sana'a, with the result that it often plunged most of the Yemeni provinces into darkness. Therefore, the security officer is looking for iron chains and not for weapons. 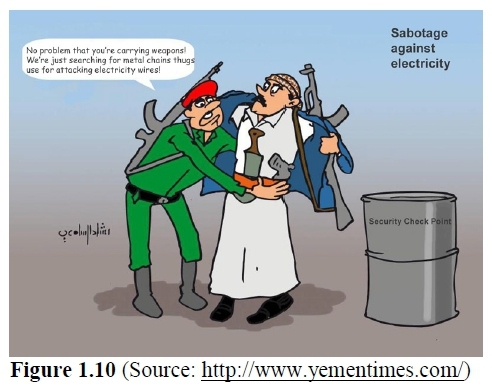 The translation would be clearer then if the translator translated the background information given by the cartoonist, i.e., fī ḍarb ʾabrāj al-kahrbāʾ ('on the attacks on electricity towers') as "In Yemen, saboteurs frequently attack electricity towers with iron chains". As for the interpersonal metafunction, the Attitude Judgment system of appraisal4, represented by the word "thug" in the TC, does not exist in the SC. During the Arab Spring, the word "thug" was used as an equivalent to the Arabic word balṭajī, which has very negative political connotations in the Yemeni and Arab societies as it is associated with anti-revolution elements. However, the perpetrators targeting the power lines were not always driven by political intentions. They usually demanded some kind of compensation from the government and they claimed that they were deprived of basic services. The interpersonal meaning would thus be better rendered through modality as, for example, "You can move around with arms, but you must not carry iron chains". As suggested earlier, the translation of the caption in the right corner of the cartoon has already made it clear that iron chains were used to sabotage electricity towers. Unlike the TC, no affective attitudinal meaning is triggered in the above suggested translation. At the textual level, the written component reformulates the visual component. A security officer is searching the tribesman carefully, looking for a metal chain but ignoring the fact that the tribesman is carrying a gun, a pistol and a jumbia. Hence, "You can move around with arms, but you must not carry iron chains" preserves not only the ideational and interpersonal metafunctions of the SC but also the parallel multimodal relation between the visual and written modes. Cartoon 6 tackles the problem of the water crisis in Taiz, one of the most populous cities in the country, and one of the most water-stressed cities in the world, where water supplies suffer critical shortages. Despite the fact that the municipality rarely supplies houses with water, the bills are regularly sent on time. The TC has conveyed the ideational meaning of the SC to a great extent, but it may be difficult for a target reader who is not quite familiar with Yemeni society and the water crisis that strikes the country to understand fully the ideational message of the SC. For instance, the fact that Yemeni houses tend to have water tanks on their roofs that are fed by a municipal water supply might not be obvious to a target reader. What the man on the roof says has been rendered perfectly through the literal translation strategy. However, what the two boys at the foot of the ladder are doing may not be accessible to a target reader. On the ground, these two boys are attacking a person and trying to pull him up the ladder. The man who is being attacked is a water corporation employee whose sole job is to read the meters. The translation would be clearer if the goal of the material clause ṭaliʿū ʾbū la-hunā ('pull him up') was translated as "this (bad) meter reader" rather than "him". It is clear from the image that the two boys are pulling someone up, but the disclosure of the man's identity makes the TC more communicative. The interpersonal meaning in the cartoon has also not been translated appropriately. The translator has used the reduction strategy and reduced the word ābūh ('his father'), which plays a vital role in the creation of humour and the funniness of the text. Ābūh is a common swear word and an expression of anger associated with the Taizi variety of Yemeni Arabic. The use of an affective word like "bad meter reader" would retain the same force of the original even if the colloquial swear word ābūh is substituted by a more neutral and standard term in the target language. Alternatively, an expression like "this crook" can be used. Another alternative would be to put in a censored swear word in English, e.g. 'this ****** meter reader', where the asterisks indicate that a swear word has been deleted. In addition, the multimodal textual links between pictures and captions are central in creating the humour of this cartoon and they must be considered in translation. The image and written text convey related but different messages. The coherence relation between the two figures is an intersemiotic additive relation. A half-naked, angry man on the roof of his house is checking the empty tanks, and he commands his two sons to force the water corporation employee to come up and check the tanks himself. A mother is watching from the window of the house, and she commands her child standing next to her to go and help his brothers as if they were doing a heroic act. In this subsection, we attempt a register analysis of the six cartoons. The six cartoons are similar in a number of register aspects, and hence we opt for having one section for the analysis of all cartoons. Having a (register) analysis for each cartoon, as we have done with the metafunctional analysis above, will render the analysis monotonous. Comparing the SCs and TCs, we can say that Field remains similar in all translated cartoons. 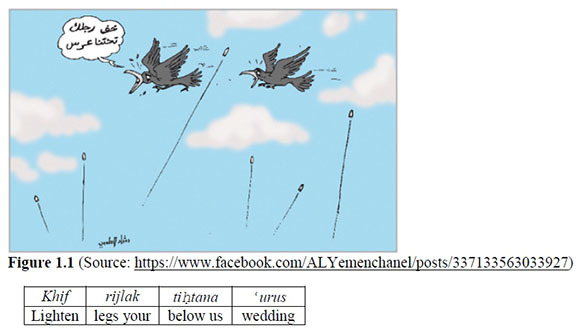 In (1), both the SC and TC relate the Yemeni tradition of celebrating marriage and, in particular, the bizarre tradition of firing guns into the sky. In (2), both the SC and TC deal with one aspect of discrimination against women in the Yemeni society, namely that women hardly step out of their homes without male companions. Even worse, a companion (i.e., the husband) is averse to walk together with his wife in view of the public. In (3), both the SC and TC describe the common phenomenon of smuggling pilgrims across the Yemeni-Saudi borders due to Saudi authorities' strict quota measures which restrict the numbers of pilgrims in each country. In (4), both relate the story of Al-Qaeda's suicide operations. In (5), both comment on the vandalism of electricity towers in Yemen, and they criticise the widespread phenomenon of carrying arms in Yemen where more than 60 million unlicensed units are in the possession of the citizens. Finally, in (6), both report on the water crisis in Yemen, especially in the southern province and populous city of Taiz. Nevertheless, there are mismatches in the amount of information that is given in the TCs. In Figure 1.2, for instance, we are clearly informed that any delay in hurrying away from the celebratory gun-firing situation will cost the bird its life. Similarly, in Figure 1.6, although there is no reference to the Saudi Embassy in the SC, a full declarative sentence has been added, i.e., "Saudi Embassy closing in response to kidnapping of Saudi official". In a similar vein, Figure 1.8 does not show that the menu is Sharīʿah compliant, thus criticising Al-Qaeda which kills innocents in the name of religion. Again, the menu is also reduced and some terms have been omitted in the TC, as we have discussed in the section above. Unlike the SC, the TC in Figure 1.10 does not refer to balaṭijah ('thugs') and the police's words are clear in this cartoon. As for the social action and the granularity of lexical items, we can argue that they are general and popular. There is a similar story as far as Mode is concerned: in both cases the cartoons are sketched/written and translated to be read and visualised. The comprehension of the message depends on both the text and the image, and thus the medium is complex. The mode of participation is also complex. All cartoons are sketched in a dialogue form: a dialogue between a policeman and a tribesman, as shown from their attire (Figures 1.9 and 1.10), a dialogue between a father and children (Figures 1.11 and 1.12), and a dialogue between the two mice (Figures 1.3 and 1.4). Even in the case of monologues (as in Figures 1.1 and 1.2) and the monologue of the man in Figures 1.3 and 1.4, there is still a lot to be deduced from both the text and image. As far as the Tenor of the SCs and TCs is concerned, the illustrators of the SCs (i.e., Rashād Al-Samiʿī and Kamāl Sharaf) are both artists, and political and social activists who have tackled a number of social and political issues in their community through cartoons. The author's provenance might be different in the TCs as the translator might not be an artist: he/she might be a journalist or a translator who was commissioned to do the translation. The rendition of social attitude is perhaps the most problematic element. 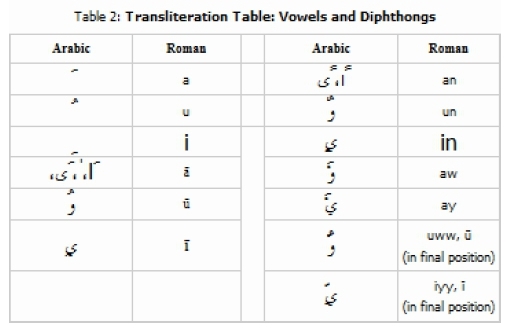 The social dialect used in the cartoons shows clearly that the authors either speak the Taizi variety of Yemeni Arabic - clearly reflected in the use of expressions such as khif arjulak (Figure 1.1), ṭaliʿū ʾbū la-hunā (Figure 1.11), lau tishtī (Figure 1.7), and midrī (Figure 1.5) - or the Sanani dialect, as illustrated by the use of mā bish (Figure 1.11) and rabanna yistir (Figure 1.3) which are not used in other Yemeni dialects of Arabic. The TCs show mismatches of this aspect in the sense that the above terms/expressions are either replaced by standard or formal terms/expressions in the TCs or they are completely lost in the translation. For instance, although the expression "Run for your life!" in Figure (1.2) is usually used informally in English, it does not retain the force of the casual expression of the original khif arjulak (Figure 1.1). This is what makes "Shake a leg" a more faithful translation. In short, most of the cartoons tend to be informal as they abound in the use of informal colloquial words, and this is where most of the translations mismatch. The genre seems to be interpreted in a similar manner in the SCs and TCs. This is already evident in the fact that the translators have preserved the original visual components of all cartoons: they have used the same drawings, only altering the written text. They use certain strategies, such as hyperbole, humour and satire, to challenge authority and to tackle key social and political issues such as marriage, terrorism, vandalism, human trafficking, the Taizi water crisis, and domestic violence. The fact that the English genre abounds in the use of some written commentaries to help the target reader understand the message of the SCs does not affect the genre of the cartoons in any way. The use of these commentaries seems unavoidable in the translation of cartoons. A possible difference between editorial and/or political cartoons in Arabic and English is that Arab cartoonists tend to associate their cartoons with some written messages; Western cartoonists, on the other hand, rarely include any written messages or contextual clues (Al-Labād and Ḥajāj 2005). Thus, the comprehension of the message of Western cartoons requires further effort on the part of the reader. This study has attempted a holistic approach to translating cartoons that stems from Halliday's (1994) SFL and House's (1977/1997) SFL-based translation model. A bottom-up analysis of six SCs and TCs was conducted and appears in the above subsections. The study concludes that if a cartoon is to be translated in such a way that the TC sounds as natural and entertaining to the target audience as the SC, the translator should take into account the context of culture, the context of situation and the metafunction(s) involved in the SC, and should try to render them as far as possible in the target language. In fact, ideational problems and context-specific problems receive more attention in the process of translation because the ideational metafunction is typically considered to carry the highest value simply because translation equivalence is often defined in ideational terms to such a degree that if a target text does not match the source text from an ideational perspective, it is not even considered a translation (Halliday 2001; Manfredi 2008; Mohammed 2011; Setiajid 2008). This does not mean, however, that a translator should underestimate the value of other metafunctions. Sometimes the interpersonal metafunction can play a vital role in the creation of humour, and a translator might easily render the ideational meaning, but interpersonal meanings may be completely lost in the translation, as we have seen in the analysis of informal expressions in the cartoons for this study. At other times, the translator's focus on ideational meaning may lead him/her to use terms that sacrifice the interpersonal meanings intended by the cartoonists. In addition, the relation between the image and written text in this multi-semiotic or multimodal genre can facilitate the comprehension of the context and the interpretation of the schemata of a cartoon. The translation of a cartoon cannot be achieved unless multi-semioticity or multimodality is considered. The intersemiotic relation between the text and image can force the translator to adopt various strategies to rewrite and recreate a cartoon that retains the communicative force of the original cartoon. Register variables have also undergone some kind of mismatch or loss in the TCs. For instance, the Field of the cartoons has been retained to a great extent, but the presentation of information differs in the TCs. Similarly, while the visual component of the cartoons remains intact, longer written messages are used in the TCs, and this is sometimes unavoidable. In other words, the visibility of the translator is obvious in the translation of cartoons, no matter how creative a translator is. The lack of equivalent colloquial terms or expressions of the SCs within the TCs creates some kind of loss at the Tenor level, even though symmetry between the addressors and addressees is not disturbed. Translation equivalence should therefore be sought at the levels mentioned above, and each cartoon should be taken on an individual basis with a view to facilitating the functional equivalence between the SC and its translation. A translator of cartoons is required to investigate the metafunctions which are prevalent in the SC and preserve them in the target language. In addition, translation is a process of contexualisation and recontextualisation, and thus the original context of a cartoon must be made clear to the target audience. The authors thank the anonymous reviewers for their valuable comments and suggestions to improve the quality of the paper. NāhiḍḤatar [The cartoon that caused the murder of the Jordanian writer, NāhiḍḤatar]. Available online: http://bit.ly/2N3JT1l (Accessed 9 January 2018). Al-Hayjami, S. 2014, November 23. fan al-Karīkatīr wa durahu fī nahḍat al-thaqafah al-ʿarabiyah: Sakhir wa qadīm … ghʾab ḥaḍir [The art of cartoon and its role in the development of the Arabic culture: Sarcastic and ancient … Absent and present]. Available online: http://alhakk.net/2012-03-31-18-36-46/2012-03-31-19-01-18/53-2012-03-31-17-31-55/8142-2014-10-23-19-00-51.html (Accessed 9 January 2018). Al-Jumhūriyah. 2008, November 23. fīḥalaqat niqāsh fīʿadan: fan al-Karīkatīr fī al-ṣaḥāfah Al-Yaminyah [The caricature art in the Yemeni Press]. Available online: http://www.algomhoriah.net/‌atach.php?id=18860 (Accessed 9 January 2018). Al-Labād, M.-D., and ʿimād Ḥajāj . 2005, March 18. Al-Karyākātīr Al-Siyāsī wa al-taʿbīr ʿan qaẓyā al-umah [Political cartoon as a manifestation of the Nation's Issues] [Al-Jazeera Arabic (TV channel)]. Available online: http://bit.ly/2m8OcNp (Accessed 9 January 2018). Baker, M. 1992. In other words: A course on translation. London and New York: Routledge. Cui, S. 2012. Creativity in translating cartoons from English into Mandarin Chinese. The Journal of Specialised Translation (17): 124-135. House, J. 1997. Translation quality assessment: A model revisited (Vol. 410). Gunter Narr Verlag. RT Arabic. 2016, September 26. Rasām Karīkatūr Maghribī yatalaqā tahdīdan bi-al-qatl baʿd nashriḥī rasman tasababa bi-īghtiyāl NāhiḍḤatar [ A Moroccan cartoonist received death threats for re-tweeting a cartoon that led to the assassination of NāhiḍḤatar]. Available online: http://bit.ly/2mbG3rKart (Accessed 9 January 2018). Setiajid, H.H. 2008. Sociosemiotic approach in translation: Two models revisited. Available online: http://bit.ly/2mEVqsL (Accessed 17 March 2018). Sharaf, K. 2013, October 7. The voices of caricature art [La Voix du Yémen]. Available online: http://www.lavoixduyemen.com/en/2013/10/07/the-voices-of-caricature-art-2/5083/ (Accessed 17 March 2018). Taran, T. 2014. Problems in the translation of comics and cartoons. Analele Ştiinţifice, Universitatea de Studii Europene din Moldova 3: 90-101. Available online: https://ibn.idsi.md/‌sites/default/files/imag_file/90_100_Problems%20in%20th e%20translation%20of%20comics%20and%20cartoons.pdf (Accessed 13 December 2018). 1 This newspaper is named after Independence Day officially came into being in the south of Yemen on 14 October 1963. 2 In cognitive psychology, a "schema" refers to a conventional knowledge structure that exists in memory, and a "script" is a dynamic schema, a series of conventional actions that take place (Yule 2014:132-133). 3 A jumbia is a traditional curved dagger worn by Yemenis. It may have an ornamental handle made of rhino horn or a precious stone. 4 Attitude is a resource of language that enables us to express our attitude(s) towards people, events, and other phenomena. Attitude is expressed through words of appreciation, judgement, or emotion.